Synopsis: Half Summer faery princess, half human, Meghan has never fit in anywhere. Deserted by the Winter prince she thought loved her, she is prisoner to the Winter faery queen. As war looms between Summer and Winter, Meghan knows that the real danger comes from the Iron fey—ironbound faeries that only she and her absent prince have seen. But no one believes her. Review: 4.5 Stars - The Iron Daughter, the second book in the Iron Fey series by author Julie Kagawa is the continuing story of main character Meghan and picks up right where The Iron King left off. Kagawa has created, for me, a sequel that was more thrilling and entertaining than the first book and has me ready to take on book three. Without any spoilers, I’ll just say this – Meghan is taken to the Winter Court by Prince Ash. She’s held there by Queen Mab and finds the friendship she thought she had with Ash strained as he puts a distance between them. All hell breaks loose when the Scepter of Seasons is stolen. Meghan, Ash and Puck come together (kind of) again to set out to find the Scepter and return it to Queen Mab before a war between the courts erupts. Remember, I’m trying to write this without spoilers. The action, adventure, writing, plot and characters were fast paced making the pages turn quicker and the excitement while reading escalate. I didn’t feel there were any lulls in the story and really felt that the characters were stronger then ever. Meghan has grown so much from the beginning of The Iron King, Ash continues to maintain his icy personality but there’s so much more to him than just that. It’s the little moments here and there that he breaks out of that ice and we see another side of him making him a character you can’t help but love. Then there’s Puck. He has that ever present good guy with a bad side you don’t often see but know it’s lurking under the surface and don’t want to be on the wrong side of. Good things and bad things happen for each character and between all three along the way, but that’s how it goes when you’re dealing with fey. 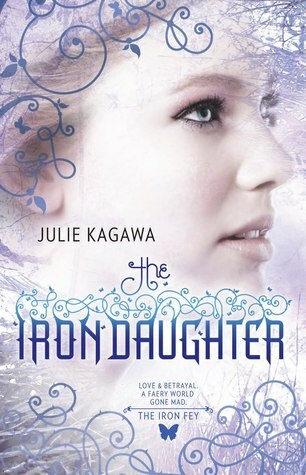 The ending was perfect and I can only imagine what’ll happen to the three in The Iron Queen. They have faced a lot and made it through; will they make it through next time? So far this is my favorite of the first two books. I fell for the story and can’t wait to read more. Kagawa’s writing and characters will have readers looking for what’s next quicker than she can write it. It’s not often a second book in a series comes in better than the first, but in this case for Kagawa it holds true, Enjoy. I agree. Enjoyed the 2nd book better too. I loved the tension in this book. I'm looking forward to reading the 3rd. It's on my shelf - just need to get to it. Thanks for your thoughts.